Robert I. Henkin is director of The Center for Molecular Nutrition and Sensory Disorders and head of The Taste and Smell Clinic in Washington, DC. He oversees the premier program in the United States dealing with cognitive aspects of human taste and smell function. The program has both clinical and research aspects. 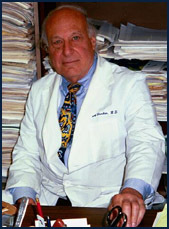 He is also associated with the National Institutes of Health, Bethesda, MD and the George Washington University Medical Center, Washington, DC. Understanding basic mechanism of human taste and smell dysfunction. Evaluation of growth factors which stimulate taste buds and olfactory epithelium. Mechanism of action of phosphodiesterase inhibitors. Biochemical studies of saliva and nasal mucus.